Barrettes are the perfect hair accessory to style a medium to long hair, but it is also possible to use them on a short hair. By following a particular method anyone with short hair can use the barrettes to style them in a perfect way. You can also use both bobby pins and barrettes to make the hairstyle look good. If you are using a small barrette, try to apply it over the bangs by just opening it gently with your hands. To take the entire bangs at the back of your head using the barrette try to mist it with a spray first. To make the bangs look beautiful, try to pull out small amount of hair for clipping it with the barrette. In case you want to make sure that your bangs don’t fall out of the barrette, try to use bobby pins to secure them perfectly. 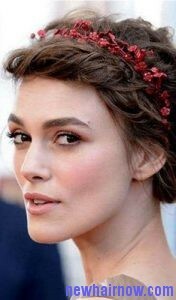 Another option that is available for styling the short hair is using a hair clip along with the barrette and try to match it with a proper outfit. Try to use small bobby pins to style the hair when you are using the barrette and push the bobby in into your hair in such a way that is covered by the hair strands. Use the bobby pins on both the sides of your head, so the hair is secured properly in place with the barrette.